Las Vegas | Conquering Vegas begins here. While the trips keep getting better, we are now entering a stage of being harder to impress. That isn’t to say that I am less passionate about Vegas just a lot more comfortable in my excitement. I’ll continue to watch countless fountain shows but now I’m much more critical. On this trip, we didn’t venture out very far from the Bellagio with the exception of a journey to the Neon Museum for the new Brilliant experience. My first review captures the essence of our trip. The absolute best part of Vegas 26 was going to see the Golden Knights in their first play-off game which also happened to be my our NHL play-off game. On Sunday night, Anne and I went to Beauty and Essex in the Cosmo for what was one of the best dining experiences we’ve had in Vegas with a horrendous ending. First, let me say that we will absolutely return. Beauty and Essex has the ultimate hipster vibe. You walk through a fully operational pawn shop before entering a dark, sparkly and velvet covered restaurant. The music played just loud enough to be noticeable but not so loud to disrupt a conversation. Our server was fantastic. Well, mostly. Anne ordered a glass of wine and I had a beer. The three items that are worth noting were the deep-fried tai shrimp, barbecue fried and the burrata and tomato on toast. All were excellent. My favorite shrimp is Emeril’s New Orleans Barbecue Shrimp. The deep fried tai shrimp is a close second. Not breaded, crispy on the outside and cooked perfectly on the inside, I would easily have ordered more. Anne is a connoisseur of French fries and she was very happy with the barbecue fries. She describes them as like eating really, really good barbecue chips but exponentially better. I wasn’t as impressed with the burrata and tomato. The burrata wasn’t all that creamy and the tomatoes tasted a bit like ketchup. The focaccia was great! I peeked over at a couple enjoying the ceasar salad toast which looked like a much better play. At the end of our meal, we were relaxed and enjoying the vibe of the restaurant. In looking at the gluten free menu and reviewing it with the server who made some fantastic recommendations, we settled on two cappuccinos and the tiramisu ice cream sundae. I can’t recommend this dessert enough. The espresso ice cream was light and flavorful, covered with rich chocolate powder and chocolate nibs and a flavorful cake base. Wait? Did I say cake? We were halfway through the dessert when I took a bite of the cake and said, “this is not gluten free.” One of the servers came over to check on us and when we made her aware, she immediately reacted. Moments later the manager came over. Before we could even explain, he apologized, comped our meal and asked Anne how she was feeling and if he could do anything for her. It was so unfortunate because everything was so great. He gave us his card and asked us to call him if we return in the future but understood if we wouldn’t be back. Fortunately, Anne was only slightly impacted the next day. We will definitely return. The Bellagio just isn’t what we wanted it to be but is exactly what we expected. The property is congested because of the tourist traffic. The pool complex is large and nice enough but lacks any privacy from the tourists walking through the resort. The room is fine but is starting to show its age. The casino was incredibly kind to me! Finally had a very nice run on the slot machines. We ate at Harvest and Prime which we fabulous. The most disappointing aspect of the Bellagio was the service. We were mistreated on several occasions including a front desk associate who, when my wife complained about the music coming from the one of the clubs, was told to “get some earplugs from the gift shop.” And the next day when we spoke with one of the supervisors was told that we were “ in Vegas” and continued by saying, “what do you expect.” This type of treatment continued in several areas of the hotel including a security supervisor being incredibly rude and disrespectful to an elderly couple at the pool for being in Cypress (VIP pool). The couple didn’t understand at first and were berated. We shared our experience with Joe, a manager, who did an outstanding job of listening to everything. He kindly removed one night of charges and sent us a bottle of champagne and strawberries for our troubles. It is as if the Bellagio relies on its name but forgets that they need to continually earn their guest’s loyalty. We will go back to the restaurants and maybe to play but I don’t see us returning to stay there unless the deal is just too good to ignore. We loved the Neon Museum and when we heard that they had a new feature, we bought tickets right away. The Neon Museum features a collection of over 200 retired and restored neon signs from Las Vegas. Brilliant is a new feature created by artist Craig Winslow which utilizes many of these signs to capture the history and spirit of Las Vegas. A story told through music and cutting edge technology called “projection mapping” brings the signs to life. Vegas geeks like my wife and I will certainly enjoy the experience. Watching Liberace projected onto a neon sign of a piano as if he were playing once gain is surreal. I don’t know if most people would be as entertained or interested but if visiting the Neon Museum, I would recommend seeing Brilliant. The Terry Fator Theatre is a fantastic venue. We’ve now seen Terry Fator, Boys II Men and Ray Romano featuring David Spade there. One of the reasons I love Vegas as much as I do is that I don’t know of any other four-mile street (the Las Vegas strip) where you can have dinner at a Gordon Ramsay restaurant at 5pm, see Celine Dion at 7pm and Ray Romano at 10pm if you wanted. While the sets were shorter than we expected, the show was worth the money. Spade and Romano both delivered and even took the stage together at the end of the show for some Q and A. If given the opportunity, we would love to see George Lopez, Kevin James and many others who are featured at the Mirage. This trip featured a lot of luck. The casino was kind but even more lucky was the fact that the Las Vegas Golden Knights played their first every play-off game on Wednesday, April 11th vs the LA Kings. Anne and I decided to be VGK fans the moment that the NHL announced that Vegas would have a hockey team. As a Yankees fan, I’ve been spoiled by lots of winning in my lifetime. This is different. The fans are still learning how to be fans. The city is figuring out what this means. The team and venue have done an awesome job in building a culture and winning certainly helps. In a closely contested game, the crowd stayed engaged throughout all three periods and the arena was explosive. However, until you’ve experiences some real hard losses and drama, you can’t find your intensity as a fan base. Conversely, I know this pain too well as a long-suffering Buffalo Bills fan. As both a Yankees and Bills fan, I can attest to the tension and anxiety that comes with each and every pitch or snap. I LOVE being a Knights fan but like the rest of the fans, I’m just happy right now. The pain will come and that’s when Vegas will learn what kind of fans they will be. Sitting in the “Fortress” for the first play-off game was a true “once-in-a-lifetime” experience and I’m grateful to have been a part of it. I didn’t need another reason to love Vegas more but as luck would have it, I certainly found one. Go Knights Go! Back home. Back to Aria. As much as I have enjoyed the moniker, “The Vegas Expert” and the website “theVegasExpert.net,” I started to feel as though this seemed a bit pretentious. Through the web and social media, I discovered a community of Vegas enthusiasts, such as myself, who are experts in their own right. For the past several months, I’ve been searching, making lists, reading, talking to friends, colleagues and other bloggers about their thoughts on a new direction to express my love and obsession with Las Vegas. I narrowed down my list to a few concepts. I asked myself what I wanted to communicate to others about Las Vegas. I’ve always wanted to provide my personal stories of Vegas geekery, reviews and opinions from myself and others, and maybe, most importantly, tips and advice on how to have the absolute best Vegas experience possible. I wanted something catchy, different and authentic. I started playing with words and concepts and one night I was playing with some alliteration using the word “Vegas” and it just happened. During a text conversation with my good friend and colleague, Eric LaCharity, it all clicked. Veni, Vidi, Vici or “I came. I saw. I conquered” which really speaks to what I want to say about Vegas. Go to Vegas; See Vegas; Conquer, or win, in Vegas. Winning just doesn’t refer to gaming but also in having the best experience possible. The further I explored these ideas, the more I thought about my personal experiences of Vegas which are filled with over-the-top and sometimes gaudy entertainment, the gluttonous meals and spirits, the freedom to be unnecessarily excessive and the fun and sometimes brutal world of gaming. Vegas feels strangely like a place that reflects the stories of ancient Roman times existing in our modern world. With that, Veni. Vidi. Vegas! was born. Since that day, I’ve been working to incorporate this brand/concept into the website and into a new business venture that I hope to start. I am happy to introduce the NEW VeniVidiVegas.net! Most of theVegasExpert.net still remains with a few new additions. 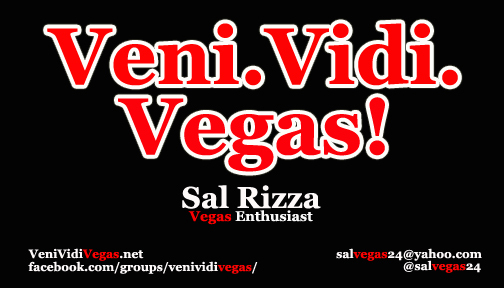 Facebook Group- For those interested in connecting with me and with other Vegas enthusiasts on Facebook, join the group https://www.facebook.com/groups/venividivegas/ . Twitter- I will continue to tweet primarily from @salvegas24 which will not only include Vegas related content but also the musings from my daily life. For Vegas related information only, please follow @veniVidiVegas . Tweets are much more seldom from this account. Shop for cool Vegas stuff- I am most excited about this new venture! I’ve opened a new Vegas shop utilizing Etsy.com. The first item is the official Veni. Vidi. Vegas! T-shirt “I came. I saw. 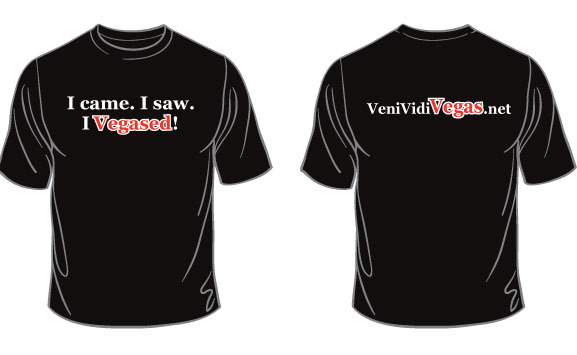 I Vegased!” which is available for $19.99 or $18.99 if you don’t mind adorning venividivegas.net on your back to help promote the site. VIMFP- I am looking forward to attending my first Vegas Internet Mafia Family Picnic http://www.vegastripping.com/picnic/ in two weeks. Knowing that so many other Vegas enthusiasts will be gathering to celebrate their love of Vegas, share their experiences and network is part of the reason I wanted to make some changes. The Professional- Ray Bendici, an accomplished author, editor and blogger (http://www.damnedct.com/. The Professor- Andrew Marvin, an incredibly intelligent professor, writer and blogger (http://andrewmarvin.net/ ) . The Ideas Guy- Eric LaCharity, a talented graphic designer and creative mastermind. The Better Half- Anne Rizza, the best school teacher and composition professor in the world. She’s also married to this guy who is obsessed with Vegas and not only humors his obsession but supports his frequent trips and daily Vegas ramblings. 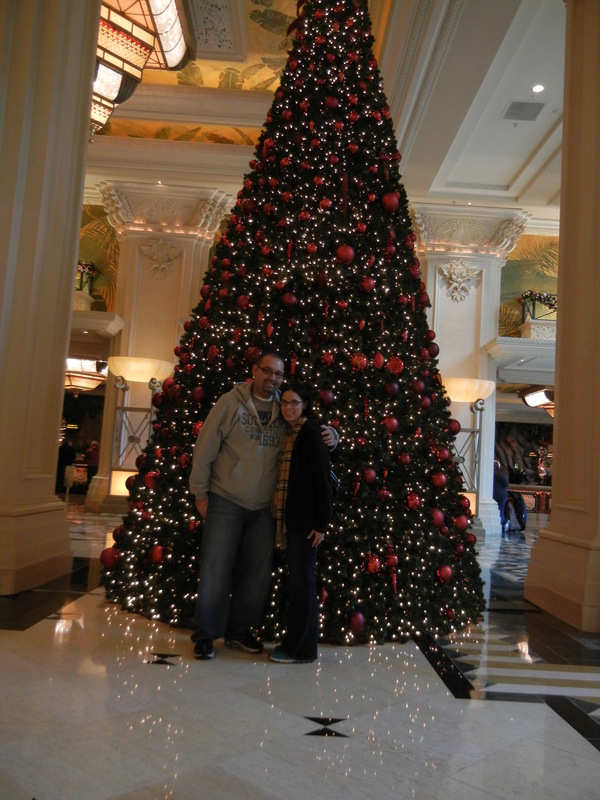 She is an awesome wife, fellow Vegas enthusiast, friend and my official partner in Vegas and in life. Athletes, actors, performers and teachers all have rituals that they have before big games, performances or major lessons. So do Vegas geeks like myself. I’m pretty sure that many of us all have our own ways to mentally, financially, strategically and spiritually prepare for the next trip to the “motherland.” Some of our ritualistic behavior may have to do with superstition, habit or just the act of getting as amped up as possible to fully enjoy the greatest place on the planet. In The Vegas Pre-Game Series, I will share the ways I prepare for my Vegas vacations. This series will be in no particular order or sequence. While some of the pre-game series will be absolutely ridiculous (like listening to Las Vegas radio stations for weeks before the trip) some will be practical advice (like researching where conventions/conferences will be in Vegas to avoid long waits at restaurants). I hope this series offers a bit of entertainment and advice and helps you find your own pre-game ritual. Vegas Viewing: The Top Five Movies You MUST Watch Before Vegas! I’m a sucker for any movie or TV show that even mentions Las Vegas. Whether it is a shot of the strip (Oceans 11), scene in a casino (Swingers) or Vegas related antics (The Hangover) watching a few Vegas themed flicks is a great way to get into the spirit. Below, I’ve listed the top five movies to watch before your trip. As a film buff, I’ll be the first to say that the movies below are NOT the best quality films about Vegas but movies that will help you get in the right mindset regardless of what type of Vegas trip you’re going on. 3. Swingers- The entire extent of Vegas in this 1996 indie hit lasts maybe 15 minutes as Trent (Vince Vaughn) and Mike (Jon Favreau) take an impromptu overnight trip to “Vegas, baby!” But within their brief foray into Vegas and throughout the rest of the film, this movie lives, breathes and screams Vegas. Some great Vegas quotes from “Vegas, baby, Vegas” “they’re gonna give Daddy the Rainman suite,” and “we’re gonna be up five hundy by midnight” all come from Swingers. I specifically recommend watching Swingers with your buddies if you’re taking a guy trip to Vegas and I dare you not to say, “you’re so money,” while you’re walking the strip. Happy viewing and Happy Vegas-ing! It may not be fair to compare any gaming city in the world to Las Vegas let alone Atlantic City. They don’t have the lights, shows, mega-resorts or attractions that bring tourists to Sin City. However, after three trips to Atlantic City, I realized that this gaming destination could be MUCH better but suffers from a community that seems to care very little or understand that their success relies on gamblers, vacationers and tourists. 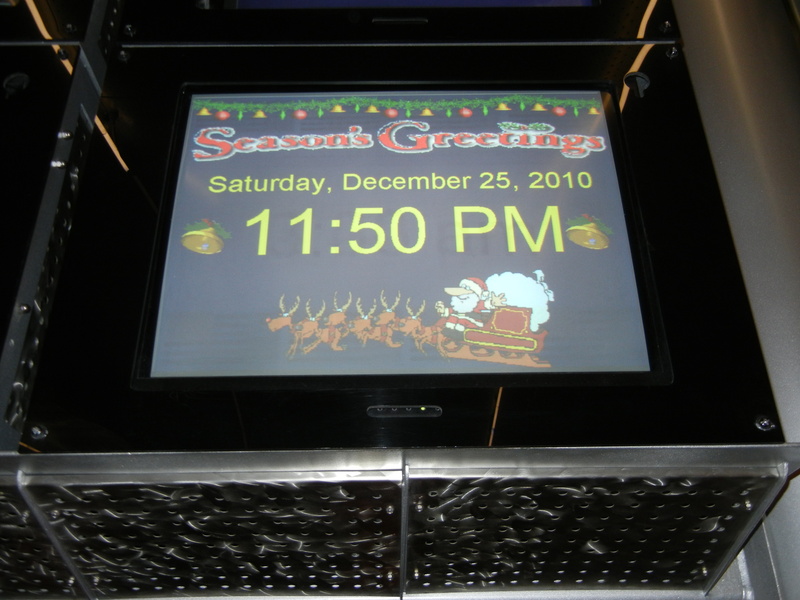 Over the past five years I’ve taken tree trips to Atlantic City (2009, 2010 and 2013) and it seems with each visit either my expectations increase OR every person including casino dealers, restaurant servers, hotel staff and retail shop owners have stopped caring. This article is less of an exercise in bashing Atlantic City and more of an ode to Las Vegas and the success of other casino destinations. The reason Atlantic City is failing has as much to do with their service and treatment of their guests as it does with their failure to invest in itself. My experiences in Atlantic City speak volumes to their failures as a tourist destination. While Macau (which seems to have become the premier gaming destination in the world) and Las Vegas are the “major league” of gaming destinations, Atlantic City is worse than the “minor leagues.” Connecticut, Mississippi and Pennsylvania casinos can be considered the Triple A affiliates of Las Vegas and Macau. But, Atlantic City is sometimes like a dying Division III football program (think the Mud Dogs from Adam Sandler’s “Waterboy”) or even worse, dare I say, the WBNA. I will spare anyone who is actually reading this of a day-by-day account of each one of my trips but I’d like to share some terrible moments that just DON’T happen in a quality tourist destination and will also offer a few positive experiences I have had. Hotel Horror- While staying at The Tropicana with a large group, we had a simple request of moving two of our guest rooms to a different floor from the other guests. After 45 minutes of being rerouted to various hotel staff members because we “came on a bus,” our request was finally granted with the words, “this better be the last change…” I don’t think Circus Circus would even treat their guests in this manner. While I was walking to my room, I noticed a room service tray in the hallway. I didn’t think much of it later that night as I figured whoever was staying next door to me must have ordered room service again. However, the next morning, when the odor was more noticeable, I reported it to the front desk to which they responded that they didn’t have room service after 6pm on Sunday so it wouldn’t be taken care of until Wednesday. Cha Ching- I lost. I gambled even more than I normally do and everywhere I played, I lost. I know of a few people that did ok on the slots but no Vegas-esque stories. Tables are fine. Variety of limits with the same type of odds. If anything, the casinos aren’t terrible. The casino at Caesars is very nice but, overall, most are equivalent to TI or Bally’s. Can I Get a Drink?- I’m a fan of good drink service in casinos as I’m sure many people are. It is something that makes a difference to me. While playing in the high rollers room and losing a good deal of money for over an hour, only once did someone ask if we wanted a drink. I was shocked. On the penny and quarter machines, the drink service was fast and continual but served in skimpy little plastic cups with a pretty raunchy attitude. The Boardwalk- Atlantic City has the great opportunity to build a beautiful strip for tourists to walk down. But, rather than nice shops, restaurants and some type of attractions along the boardwalk, it is littered with crappy souvenir shops, shady massage parlors and unappealing food stands. With a view of the ocean and a seaside appeal, this area could be a major attraction. Where Shows Go to Die- I saw Steve Wyreck in Vegas. It was the worst Vegas decision I ever made. His show was a featured house show in Atlantic City. This seems to be the overall theme of Atlantic City. I’m going to be easy on Atlantic City here as I haven’t seen any of their shows but with Legends, Beetlemania and an I Love Lucy; Live on Stage show, being the only consistently running house shows I doubt any of these shows compares to any Cirque show, Peep Show or even George Wallace. Pay to Park- Self explanatory. Some Good Stuff- I’ve stayed in The Tropicana twice because the rooms are actually not bad, the rates are great and they have a nice selection of games, restaurants and the location is convenient. The comps are great and I like enough about it to stay there…when it is free or close to it. My stay at the Taj Mahal was mediocre. They were nowhere near as awful as my stay at the Imperial Palace but they weren’t as good as any of my stays in Vegas including TI. Some of the restaurants are incredibly good. I had an amazing dining experience at Michael Mina’s Seablue in The Borgotta. The Tanger Outlets, which are across the street from the strip of casinos, is a nice shopping complex with a variety of stores. Philadelphia is only 3o minutes away. Caesar’s Palace is very nice. The casino feels like a Vegas casino. The shops feel like a mini version of the Forum Shops and if you head to the third floor of the shops, you can sit in beach chairs and relax in a comfortable environment with a drink or coffee with an amazing view of the ocean. The comps pay well. 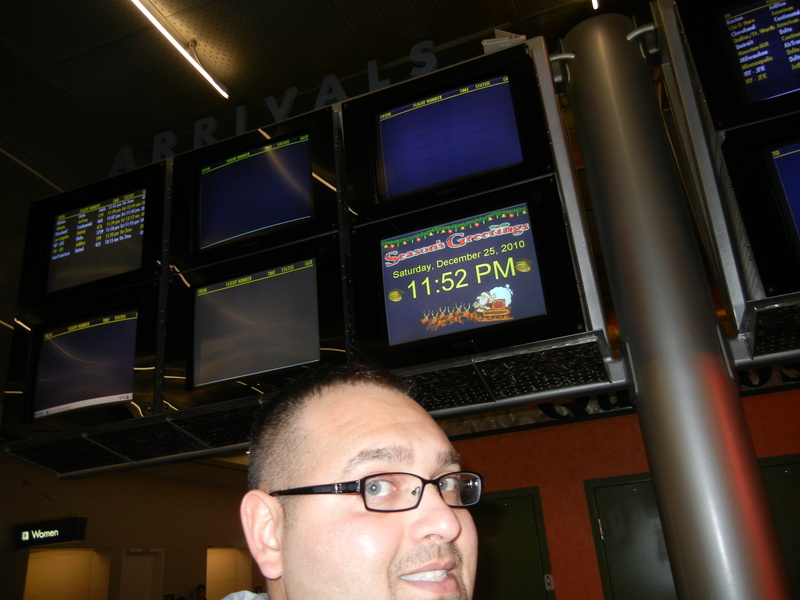 After spending two nights at The Tropicana and playing as I would in Vegas, I earned over $50 in express comps, free meals and offers to return with two free nights, meals and free slot play. I can’t speak to the rewards at the other casinos. Las Vegas was built in a dessert. Mohegan Sun and Foxwoods stand in the middle of rural Connecticut. Macau is barely 15 years old as a gaming destination. Atlantic City is wasting away its potential. This once vibrant and attractive destination continues to deteriorate. It can’t be that the northeast is short on gamblers or people looking for a fun place to spend a weekend as Pennsylvania and Connecticut are doing very well. As someone who enjoys the casino atmosphere, I wonder if Atlantic City will ever take a look at what Las Vegas or its nearby competitors have done the last ten years and invest in itself.